2017 was a tough year for the traditional retail industry. The shift toward the online space was a trend many weren’t able to respond to, resulting in a spate of bankruptcies and store closures. 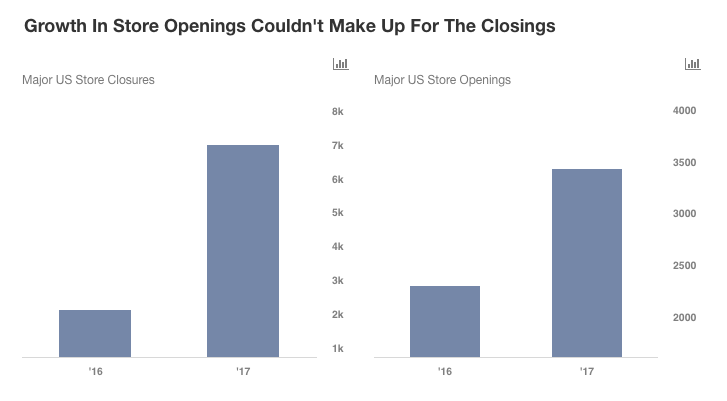 In fact, the store closure announcements more than tripled, while the number of bankruptcies in 2017 was up 30% over the previous year. While most of these are small stores, there are some big names in the list, including Gymboree, Payless ShoeSource, Rue21, RadioShack, Wet Seal, and The Limited. Women’s specialty apparel was a segment that was particularly blighted, given its highly competitive nature, which makes the achievement of higher margins pretty unlikely. This is because, since the merchandise is very similar across most retailers, they resort to reducing prices in order to gain market share, which has been wreaking havoc on the bottom-line for many such companies. According to data supplied by Fung Global Retail and Technology, a retail think tank, store closing announcements in 2017 reached 6,985, a 229% jump over the corresponding figure for 2016. While the store openings were also 50% higher than the previous year, they came in at 3,433, less than half the number closed. Moreover, most of the openings were by discount stores Dollar General (1,285) and Dollar Tree (650). Moreover, as per the latest available data, there have been about 662 bankruptcies in the retail sector in 2017, which is a rise of 30% over the previous year. In more frightening news, the number of US retail and apparel companies facing a high risk of default or bankruptcy continues to grow, surpassing levels reached during the 2008 recession. The bar charts above have been made using our new, interactive platform. 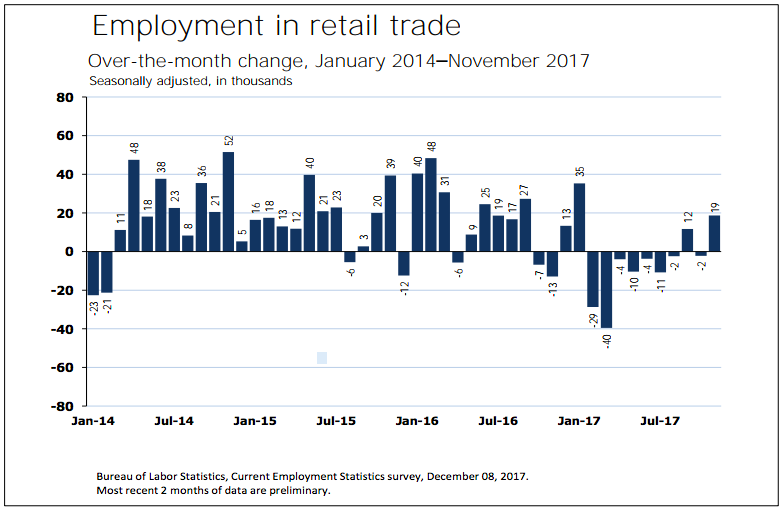 While unemployment rates have been at their lowest levels for a long time, retail was one of the few industries where employment fell versus 2016. According to the latest available data from the Bureau of Labor Statistics, “the industry has lost 71,000 jobs since reaching an employment peak in January 2017.” Although this has been a result of the bankruptcies, store closures, and a shift towards automation, it could also be impacted by the shift to the online channel, as those jobs are considered warehousing or logistics jobs, and not retail jobs, according to Jack Kleinhenz, chief economist for the National Retail Federation. Omnichannel retail is the ability to seamlessly integrate different channels, whether it is in-store or online, in order to offer consumers a coherent and consistent experience no matter what platform they’re using to shop. In today’s environment, relying on just the traditional brick-and-mortar storefront would be a gigantic misstep. Businesses would be unable to survive for long if they don’t move along with the shift in technology. The increasing rates of internet penetration and a proliferation of smartphones have propagated the rise of online shopping. Furthermore, the added convenience which enables consumers to shop where they want and when they want are other factors that will ensure the growth of this segment. Features such as free shipping, expedited shipping and same-day delivery, and buy online pickup in store have attracted consumers to shopping in this space. 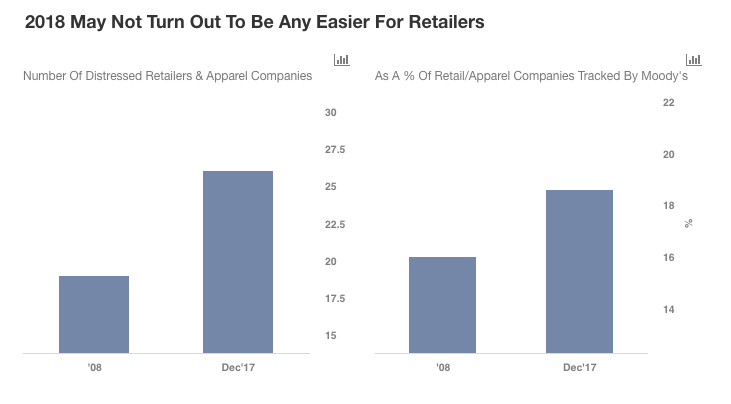 Hence, it is imperative apparel companies achieve a seamless digital shopping experience, and incorporate the aforementioned conveniences to keep the customers coming back.